DJR rendering of EPNI farm proposal. On Dec. 7, 2018 the Minneapolis City Council voted to deny any space at the Roof Depot site for the East Phillips Indoor Urban Farm project, replacing it with a voter services office, class space for ELL, citizenship classes and resume building and meeting space for community conferences. Adding these features here does not respond to the needs of this community. First, all can be accommodated at the nearby East Phillips Park Cultural & Community Center, which this community funded, designed and caused to be built. Second, the critical lack of parking and extreme traffic congestion at the Roof Depot site make it seriously problematic for any of these activities. It would be helpful if more council members were familiar with this location before voting to further challenge it. However, council member Cano inserted several caveats in her “Staff Direction” document which provide a door to re-enter. It provides the possibility of a two-site solution, which we are pursuing. Follow this link for city information: https://lims.minneapolismn.gov/File/2018-01471. • All decisions affecting the East Phillips Indoor Urban Farm (EPIUF), the Roof Depot Site and the community must include timely and meaningful input from all affected namely, the East Phillips Neighborhood Institute (EPNI) and the community. • The new Hiawatha Advisory Committee (HAC) must include members from EPNI and the community to be chosen by EPNI and the community. 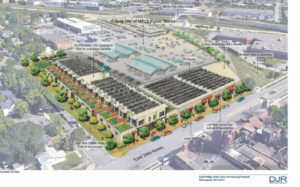 • 1-acre at the south-east corner of the Roof Depot site including a saved portion of the Sears warehouse building be designated to house the bike repair facility, the lo-tech aquaponics and gardening, the coffee shop and World Café, the certified commercial citchen and cultural carket. • 1.5-acres at CPED site at E. 26th St. and Minnehaha Ave. will house the high-tech aquaponics, an existing local business, commercial kitchen and job training area for community and Aurora School. The priority goal of EPIC’s 2014 attempt to purchase the Roof Depot site was to eliminate the environmental injustice that has plagued East Phillips families and children for generations, in particular those of our Native American neighbors, by preventing more pollution at the site. The city is now thwarting these goals and making things worse. Who in good conscience could endorse such a policy? 1) Commit to converting its’ Hiawatha Campus fleet of vehicles to pollution free electric or hydrogen vehicles by Jan. 1, 2022. 2) Commit to mitigating the congestion effects of its additional commercial and worker vehicles by all means possible including seriously pursuing an entrance and exit to the Hiawatha campus from and to Highway 55. 3)The city must use its influence to find alternate locations for Bituminous Roadways and Smith Foundry encouraging them to leave East Phillips while also using its influence to convince the MPCA to use all the tools at its disposal to stop the pollution in East Phillips including using the Clark – Berglin Environmental Justice Bill written specifically for this neighborhood for this purpose. We are also asking the city to provide monthly reports to the affected community and organizations.